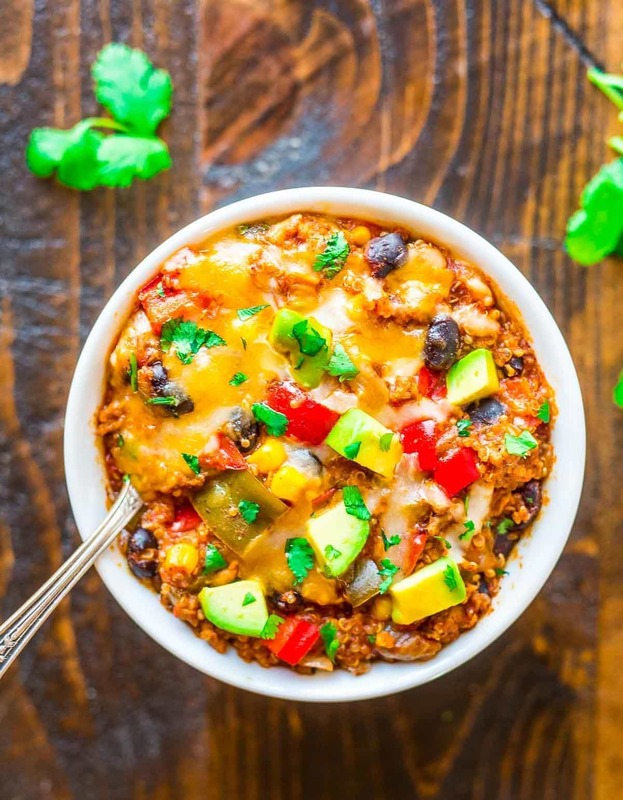 Crock Pot Mexican Casserole is protein-packed with quinoa, black beans, and ground chicken or turkey. This Mexican casserole is healthy, gluten free comfort food, and one of the best crockpot recipes for Taco Tuesdays or Cinco de Mayo! I’m beginning to wonder if my appetite has some sort of homing beacon that orients itself toward Mexican food. If it’s been a few weeks since we’ve eaten it, the next time I enter the grocery store, I’ll find myself drifting toward the enchilada sauce and chili powder, as if being pulled by an invisible string connected to the end of my grocery cart. Such was the case the week I made this Crock Pot Mexican Casserole. My homing beacon called, and this healthy Mexican slow cooker recipe answered! I attribute my regular cravings for Mexican flavor to my mother, who I’m convinced needs a dose of Mexican food at least twice a week in order to maintain her equilibrium. Growing up, at least 50% of the meals we ate out were Mexican…or “Mexican” depending upon how strictly you define the term. During summer vacation when my sisters and I were out of school, we’d cruise the Hispanic area of town, stopping at whichever eatery looked the most legitimate for lunch. The less English visible in the windows, the better. If we were running errands and needed to make a quick stop, nine times out of 10, we’d pick a place where I could order some version of chicken enchiladas. On Sundays after church, we frequented our city’s local version of On the Border. Our traditional Christmas night dinner? My grammy’s Green Chile Chicken Enchiladas. Clearly, the love of Mexican food spans generations. Now, I will not for a second pretend that the Mexican recipes I make at home, such as this Crock Pot Mexican Casserole, are authentic, but that doesn’t mean they aren’t delicious. 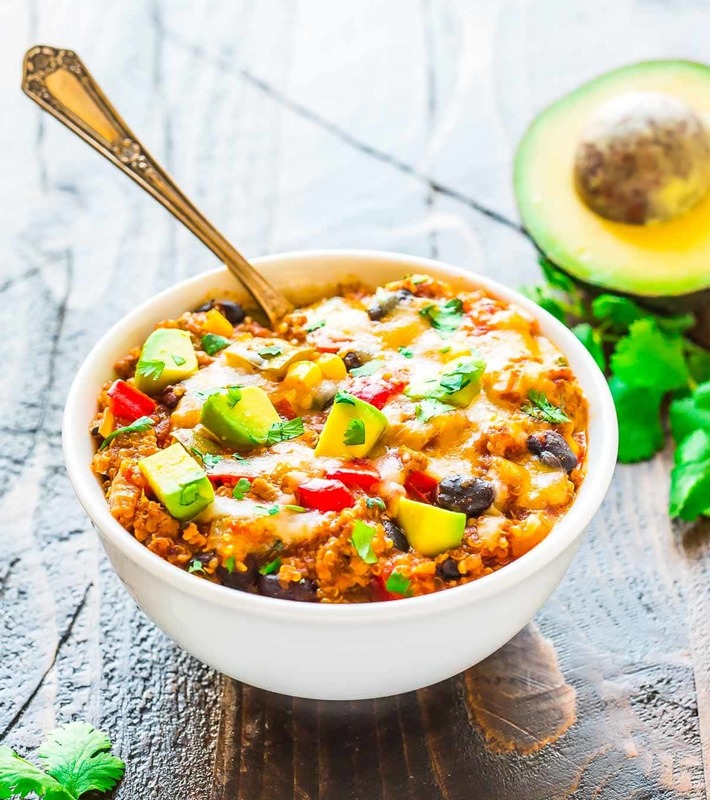 Like the more authentic Mexican food that inspired it, this ground turkey slow cooker casserole is the right mix of comfort and freshness. The spices are rich but not overpowering, and like my other slow cooker Mexican recipes, from Taco Casserole to Slow Cooker Chicken Enchilada Soup, it’s a complete crowd pleaser every time I serve it. 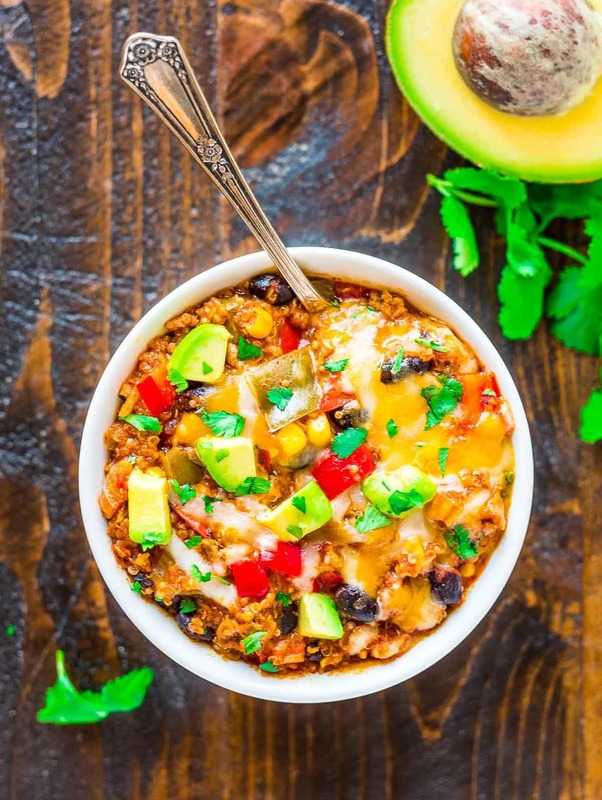 This particular Mexican casserole recipe is ultra easy to make, reasonably healthy, and offers the convenience you are seeking when you pull out your crock pot. No, you won’t find this crockpot enchilada recipe on an actual Mexican restaurant menu, but when your family is clamoring for second helpings, you’ll be too busy congratulating yourself on serving an easy meal that’s loaded with fiber and protein to worry about that small detail. A few key ingredients make this Crock Pot Mexican Casserole extra satisfying and extra simple to prepare. 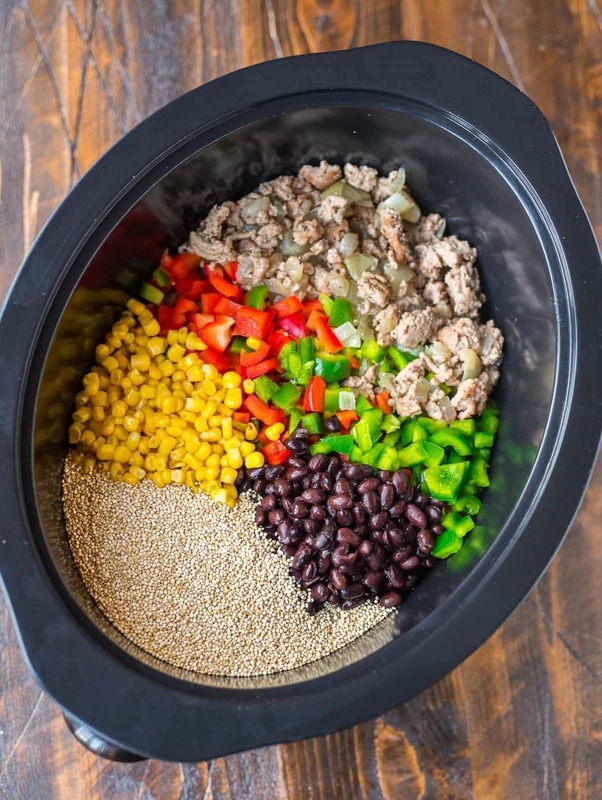 All three pack mega fiber and protein, which means this Crock Pot Mexican Casserole will keep you satisfied long after it is served. If you or your family prefer, you can use ground chicken to make slow cooker Mexican casserole chicken or use lean ground beef. To fit the recipe into your collection of crockpot vegetarian recipes, replace the meat with extra black beans. This healthy Mexican slow cooker recipe yields a generous amount, but the leftovers reheat like a dream. This Crock Pot Mexican Casserole also freezes exceptionally well. Make this recipe tonight, then stow some away for the next time you need a fast, healthy dinner…or for when your own Mexican craving strikes! This meal is really a slam-dunk all-in-one, so you don’t have to put something on the side. That said, I do always love to add a green veggies. This would be excellent with a simple green salad, sautéed spinach or kale, or oven-roasted brussels sprouts. Slow Cooker. Be sure it is at least 6 quarts (you could maybe squeeze it in a 5 quart, but I haven’t tried). For a 3-quart slow cooker, reduce the recipe by half. 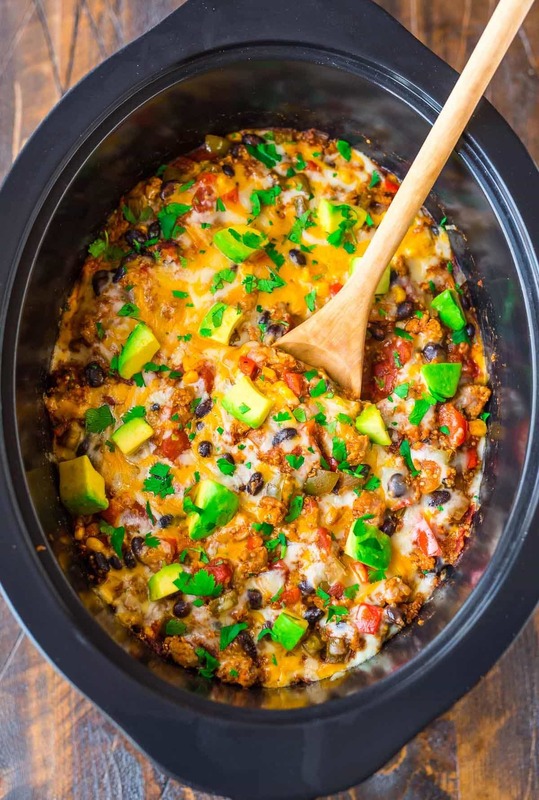 Super easy and DELICIOUS Crock Pot Mexican Casserole with quinoa, black beans, and ground chicken or turkey. Healthy, gluten-free comfort food! Heat the olive oil in a large skillet or Dutch oven over medium high. Add the turkey and onion. Cook and stir, breaking up the turkey as you go, until the turkey is no longer pink, about 5 minutes. Transfer to the bottom of a large slow cooker. 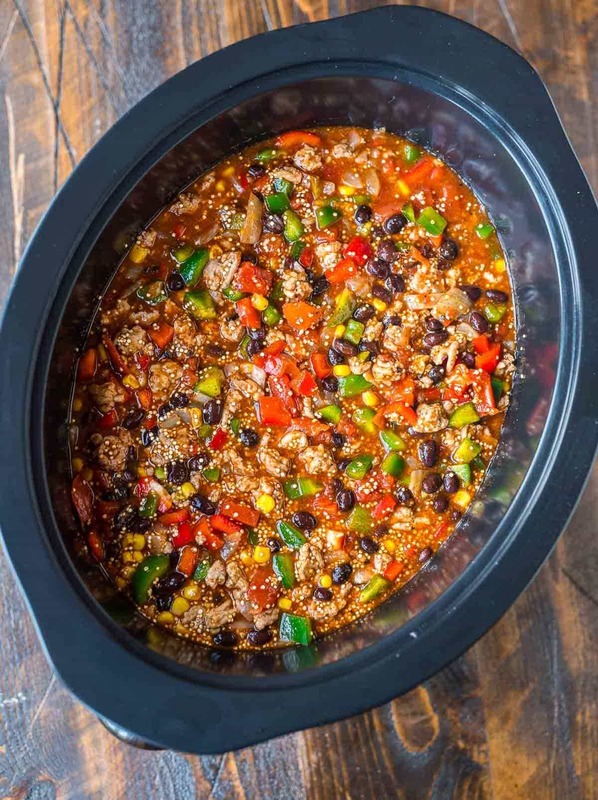 To the slow cooker, add the quinoa, enchilada sauce, black beans, tomatoes, corn, red bell pepper, green bell pepper, chili powder, cumin, garlic powder, and 1/2 cup water. Stir to combine, then cover and cook on high for 2 1/2 to 3 hours or low for 5 to 6 hours, until the liquid is absorbed and the quinoa is tender. Remove the lid and stir. Taste and adjust any seasonings as desired. Stir in 1/2 cup of the shredded cheese, then sprinkle the remaining cheese over the top. Cover and cook on high until the cheese melts, about 10 to 15 minutes. Serve hot with any desired toppings. Make it ahead: You can sauté the turkey and onions up to 1 day in advance and chop the peppers 1 day in advance as well. Store in the refrigerator in separate containers, then add to the slow cooker according to the directions when ready to cook. Store leftovers in the refrigerator for up to 4 days or freeze for 3 months. Let thaw overnight in the refrigerator and reheat gently in the microwave or in a casserole dish, covered, in the oven. Thanks, Marina! I hope you enjoy it! We don’t have great Mexican restaurants near us and that makes me sad! I’m trying this recipe for sure. That IS sad, Liz! I hope you enjoy this recipe. This looks fantastic!! I am absolutely going to try this out! Looks amazing! Im making it this weekend! Thanks, Michelle! I hope you love it! I think I will try this. It sounds so good and it’s easy since you can do it one day ahead! Thank you for the wonderful recipes. I like the make-ahead option too, Hazel! Thank you for your kind words about my recipes, and I hope you enjoy this casserole! Looks delicious! Make sure you take the leftovers, roll them up in tortillas, pour enchilada sauce over that, then top with cheese and bake. Remember, I am still the casserole queen! How long would they bake for? Hi Brandy, if the filling is cold, you’d probably want to start with at least 30 minutes and cover with foil if the top starts to get too brown too quickly. If you do try this with leftovers, I’d love to hear how it turns out! This would be such a massive hit here, the perfect weekend family dinner! hey girl- this looks amazing! I love mexican food! This was a great dinner! We didn’t have fire roasted tomatoes so used a jar of trader joes no salt added fire roasted salsa, but will try it with just tomatoes next time. Its all packed up with some multigrain tortilla chips for my husbands lunch tomorrow, thanks for a yummy meal that’ll last all week! Hi Rupa! I’m so glad you enjoyed the recipe. Thanks for sharing your feedback—and I hope you love the leftovers too! Just made this last night and had to report back (yet again!) that this was DELICIOUS! This will definitely go into our regular rotation. And so easy which I love. Thanks again for a great recipe. Liz, I’m so glad the recipe was a hit! I really appreciate your taking the time to leave this awesome feedback! Hi, this looks wonderful! Do you think that I could substitute the quinoa with uncooked rice and cook it in the slow cooker for the same length of time? Thanks for your terrific recipes! Hi Lynn! I’m afraid I can’t say for certain, as I only tested the recipe with quinoa. Generally because different grains have different cook times and require different amounts of liquid, you can’t always swap directly, and you would be experimenting. I suggest you compare the liquid ratios and cooking times of the rice you’re considering to quinoa, then adjust from there. If you decide to play around with the recipe, I’d love to hear how it goes. Laura, thanks so much for giving the recipe a try and reporting back how it went with brown rice! I’m happy to hear you enjoyed it! Did you make this with rice? If so I’d love to know what adjustments you made. We are not quinoa fans. Thanks! Hi there, no, I haven’t had a chance to make this with rice yet. It is in my pile of recipes to try. Once I do make it, I will report back! Made this last night!! Delicious. I may make nachos tonight with the left overs. It was almost like the turkey quinoa sweet potato chili recipe you have posted. I love how healthy they both are!! Thanks for taking the time to leave this awesome review, Natasha! I’m so glad to hear you enjoyed the casserole, and I love the idea of repurposing the leftovers into nachos! How many grams are in each serving? Hi Nick, unfortunately, I don’t have a weight measurement for each serving, but if you mean the nutrition information per serving, that’s listed below the recipe! Entered this recipe in a crockpot cook-off and won first prize! The avocado topping sealed the deal for me. Thanks for sharing it! WOW Elizabeth! I am so happy to hear that this recipe had crowd approval. Thanks for letting me know and leaving this wonderful review. I’m so glad you all loved it! Very tasty! Healthy, incredibly filling and easy to prepare. Do you think it could be done with raw chicken instead of cooked turkey? Hi Alison, yes you can use chicken! You could experiment by adding whole raw chicken breasts to the crock pot, adjusting the cooking time, and then either dice or shred the chicken once it’s done. The safest bet with how the recipe was tested, though, is to swap ground chicken and follow the directions, because I 100% know that will come out. This was excellent! We omitted the meat to satisfy vegetarians in the family. Everybody loved this dish and even begged for the leftovers. The quinoa seems to give this dish some body that might otherwise be missing without meat. Will definitely make this again! Mary, I’m so glad this recipe was a winner! Thanks so much for trying it out and taking the time to leave this nice review! That sounds like a great idea, Deb! Thanks so much for taking the time to share how the recipe went—I’m happy to hear you enjoyed it! Oh no, Matt! Only certain slow cookers have inserts that are okay to use on the stovetop, so perhaps yours was one that wasn’t. I hope you were still able to find something delicious to eat and can give this recipe a try again soon! This was great, I made it for father’s day. Everyone loved it. I’m so excited to hear you enjoyed it, Lori! Thank you so much for giving it a try and reporting back! Very easy, and very good! What is the amount per serving? It’s blank above in the nutritional facts. Thiss is delicious and my whole family loves it. Thanks! Hi Emily! I am so happy you all love this! I didn’t measure it cup for cup, but it was calculated based on 1/8 of the recipe, since this yields a generous amount. Thanks for trying the recipe and letting me know how it came out for you! I prepared this tonight for dinner quests tomorrow. I put it in the freezer because you said it freezes well. Can I just put it on the crock pot or should it defrost first? I’m assuming it may take a little longer if it’s frozen. Nancy, is it already cooked? If yes, I would let it thaw overnight. You could reheat in the oven in a casserole dish (best option so that the quinoa doesn’t over cook), microwave individual servings (also works well, though maybe not ideal for guests), or reheat in the crock pot (probably my last choice, since it will reheat slowly and again, might overcook). I hope you all enjoy it! Really easy and yummy! I added fresh squeezed lime to give it a little more flavor. I’ll make again and its great for leftovers! Thanks for another yummy, healthy, easy recipe! Sara, the extra lime sounds delicious! Thanks so much for giving the recipe a try and for taking the time to write this awesome review! Made this last night! Will definitely be going into my rotation! It was so good and so healthy! I can’t wait to try out more of your recipes! Krystin, I’m so happy to hear you enjoyed this recipe! Thanks so much for taking the time to leave this awesome review. This was super tasty! My husband liked it, and 2/3 of my toddlers did too! I topped with all your suggested topping and the Greek yogurt in place of sour cream, guacamole and it was yummy! Seriously, I have never left a reply EVER to a recipe before but this was SO AMAZING I just had to! My man is out of town for work so I was looking for a healthy meal I can eat every night this week (hey I’m on a budget lol). I just made this and it is SO delicious! I used green sauce instead of red, just my preference, and put some in a couple of tortillas. Wow, I definitely won’t get bored having this for dinner every night this week! Thank you so much for sharing! Also, I’m on weight watchers and this was a perfect meal to work into my plan! You rock! Hi Liza! I’m afraid I’ve only tested this in a larger crockpot, so I can’t guarantee results for a smaller one. I’d suggest cutting the recipe down by about 3/4 and watching the cooking time, since it might cooker faster/slower, depending on your model. I hope you enjoy the recipe if you do try it! What size quart, do you consider large? 6? Hi Eliza! Yes, 6-quart is standard/large. If I weren’t to add quinoa what would be the cook time? I have pre-made rice I was going to heat up and just throw in. Thanks! Hi Alyssa, the rice should be fine to add toward the very end, but the liquid ratios will need to be adjusted, likely significantly less since there is no quinoa to absorb it. You are welcome to experiment, but I’m afraid I can really only vouch for quinoa, since that’s how the recipe was tested. It may not need quite as long timing-wise since there’s no grain to cook. I’m probably going to leave out the water and maybe a little bit of the tomato juices. Hubby just isn’t a fan of quinoa at all but I can’t wait to make this later this week! Hi, if it helps, I made it as the recipe stated, but with minute rice. I did 1 cup rice and the 1/2 cup of water already in the recipe. I did 4 hours on high. My hubby doesn’t like quinoa either. Not quite as much body as pictured, but got two thumbs up. Thank you so much for chiming in, Samantha! Loved this! Wondering if I can double this? I have a large crowd coming for dinner tonight, and this would be a great easy dinner! Hi Stacy! I think that would be pretty risky, because the lasagna would get so tall, it would be too thick to cook properly. Is there a second crockpot you can borrow? I bet that would be your best bet! You could also try experimenting with doing one in the crockpot and one in the oven. I haven’t tried this myself, but would imagine you could bake it in the oven until hot and bubbly. If you do try the recipe, I hope you all love it! Hey there! I’m not generally one to comment but you may want to put a disclaimer that not all crock pot inserts can be placed directly on the stove to brown your meat. I ended up with a broken crockpot and the worst mess of my life. Smelled like it would have tasted amazing though ?? Hi Rebecca, the recipe doesn’t actually specify to do this, but to use a skillet or Dutch oven for the stovetop part. Some crockpots are designed to allow stovetop cooking with the insert, so if that’s something your model claimed to be able to do, it definitely sounds like a manufacturing default! I hope you love the recipe if you do give it another try! Just made this with ground chicken and with no quinoa, then put it in a wrap! It was SO GOOD!!! 10/10 would make again. That’s a delicious idea to put it in a wrap, Holly! Thanks so much for taking the time to give this recipe a try. Made this today using hamburger meat and subbed pinto bean for the black beans. Black beans don’t always agree with me! This was a hit! My family loved it. Some leftovers I plan to use on nachos! Thanks so much for a great recipe! Pam, thanks so much for giving this recipe a try and for sharing your tweaks! I’m glad to hear you enjoyed it. I work for the fire department and made this meal several times for a crew of 5 and it was awesome. Had at least two cups of left overs each time for lunch. Love the recipe and will definitely be continually making it again. Bryce, I’m so glad to hear this recipe is a hit! Thank you so much for taking the time to give it a try and report back. I am, once again, thrilled with another one of your recipes! This one was fantastic! It came out perfectly and it was soooo easy! I was glad it made a lot so, I had plenty for leftovers! What would you add instead of the meat to make it vegetarian…or can I just omit the meat all together? Hi Jamie, you can use extra black beans instead! How would you adapt this for an Instant Pot? Catherine, I don’t have an instant pot yet, so I’m afraid I don’t know! I’d suggest following online instant pot conversion guidelines for similar recipes. I came across this recipe while searching for some decently healthy crockpot recipes. After browning the turkey I sautéed the onion and green pepper in the remaining oil and turkey flavoring. I used avocado oil because it has a higher smoke point when compared to olive oil. Pretty much followed everything else. A little squeeze of lime juice before serving really bring it to life. Erin, you are spot on with this recipe! Dinner for the second night and it will be lunch tomorrow. I will definitely be back for some more goodness from you! Eric, this kind note means so much. THANK YOU. I’m so glad you loved the recipe, and I hope you love the next ones you try too! Can you tell me how spicy this is! We love Mexican here, but my kids don’t always like the spice! Thanks! Hi Christine, this recipe isn’t too spicy, especially if you make sure to use mild enchilada sauce. The spice level can also depend on the type of chili powder you have too, so you may want to give yours a taste to see how spicy it is! I just made this and it is amazing and so simple to make!! My question is, can I make this recipe (possibly as a casserole) with cauliflower rice instead of quinoa to reduce calories? Hi Kelsey, I’ve only tried this recipe with quinoa, so making it with cauliflower rice would be an experiment. The liquid ratios will need to be adjusted, likely significantly less since there is no quinoa to absorb it. You are welcome to experiment, but I’m afraid I can really only vouch for quinoa, since that’s how the recipe was tested. It also may not need quite as long timing-wise since there’s no grain to cook. Hey! This sounds so delicious can’t wait to make it! Question though how much is one serving size I.e. 1 cup etc. just curious! Thanks!! Hi Samantha, unfortunately, I didn’t measure each serving, so I’m not sure what the exact measurement is. I calculated 8 servings from the dish, so if you’re interested in knowing the exact portions, I’d eyeball one-eighth of the dish and measure that! I hope you enjoy the recipe! This recipe is amazing!!! I used fresh chicken instead of group and topped with lime, fresh avacados, tomatoes. Yum yum!!!! Thank you for this. Mary, I’m so happy to hear you enjoyed the recipe! Thanks so much for taking the time to report back! I am going to try this in my instant pot tonight! I will let you know how it turns out! Looks delish! I hope you enjoy, Jen! I’m happy to hear the recipe is a winner, Theresa! Thanks for giving it a try and reporting back! Made it this morning for the first time. Just got home from work and the quinoa just looks like little white worms. It’s not plump or anything like rice would be. I’ve never used quinoa before, is this to be expected? It’s been cooking on low for 6 hours. Hi Melissa, were the grains soft when you tried them? If so, they were cooked! If they were still crunchy or hard and there was still a ton of excess liquid in the crock pot, then something happened. The white “worms” you see are normal and are part of the quinoa seed, and they become more visible when the quinoa is cooked. I hope you enjoyed the recipe! This was delicious and easy. My 4 year old even commented that the house smelled so good. Thanks! Mary, I’m glad this recipe was a winner! Thanks so much for sharing this great review! Yummy! I was afraid the 2 Tablespoons of Chili Powder would be too spicy, but it wasn’t. Just flavorful. Also, I rinsed and drained the quinoa before adding as I had read somewhere that quinoa could have a bitter or sour taste if not rinsed. Add the casserole with corn chips and it was a very tasty dinner. Thank you for such an enjoyable, easy recipe! Thanks for taking the time to leave this awesome review, Susan! I’m glad you enjoyed the casserole! Hannah, you can make these with regular diced tomatoes! As far as the cheese, that is personal preference. I think you could safely use half the amount. If you want to omit it, the recipe will still come out, but won’t have quite as much flavor. If you try it, I hope you enjoy it! Amazing! I used organic no salt canned goods to reduce the sodium and didnt add any salt extra. Also put in 2 jalapenos just to add some spice. Perfect easy dish that tastes wonderful. I’m so happy to hear how much you enjoyed it Zoe!! Thanks for taking time to leave this wonderful review! If i want to omit the corn, do you think that will matter? Do i need to replace it with something, maybe more black beans? Hi Jennifer, yes you can omit the corn if you prefer! I would add a little more black beans or some additional chopping bell pepper, but it would probably still turn out without replacing it. I hope you enjoy the recipe! Amy, I’m so glad you enjoyed the recipe! Thanks so much for taking the time to leave this awesome review. Great go-to recipe that meets the various needs and palates in my household–gluten free, filling, full of flavor. Thank you! Maureen, I’m so glad to hear this recipe is a winner for your household! Thanks so much for taking the time to leave this nice review! DELICIOUS! I found this recipe 5 days ago. We tried it today for dinner and IT WAS A HIT!! I made mine a meatless dish by using Beefless Ground Crumbles…no one knew LOL! I despise cooking and it was so easy and painless for me. Will definitely make again SOON! WOOHOO Frances! Thanks for the tip about making it meatless. I’m so glad to hear you enjoyed this! Total yumminess! Super simple and hearty. I substituted 1 cup minute rice for the quinoa, I kept the water/liquids the same and I let it go 4 hours on high (mostly because that is one of my options on my crock/pot ?). Other than that (and a tad less chili powder for my hubbies taste buds), I stayed true to the recipe. Thank you for sharing! Going into my slower cooker go to recipes for sure. ❤️? WHOOO HOOOO! I am so happy to hear how much you enjoyed it Samantha. Thanks for taking time to leave this wonderful review! Our new family favourite, have cooked this several times so tasty and easy! HOORAY Brooke, I’m so happy to hear you found a new favorite! Thanks for taking the time to leave this awesome review! This was amaaaazing! I only had a red and an orange bell pepper so I used those and then we cut up a whole rotisserie chicken and added it to everything at the very end to warm through. Topped it with nonfat Greek yogurt, avocado, cilantro and a sprinkle of cheese. Cooking time was only three hours on high! My husband went back for seconds, so I know this is a winner….so comforting and full of flavor, will be adding this to our Fall/Winter repertoire. Thank you, Erin! HOORAY Molly, I’m so happy to hear this recipe was a hit! Thanks for sharing your tweaks and for taking the time to leave this wonderful review! That’s a great idea! I hit on this while looking for something for the day after Thanksgiving– we decorate that day. I could use this with leftover turkey! What a great idea Cindy! Thank you for the suggestion, and I hope you enjoy it! Made this last night and it is fabulous. This is the 1st recipe I have made from Well Plated and I’m hooked. I’m very excited when I get a new recipe from this site. I had everything cooked and chopped the night before. My husband who is NOT a cook, put it all together for me in the crockpot at 3:00 and we were eating at 6:00. The taste was fantastic!! Very healthy, good for me on my weight watchers program, and my husband loved it. He is a very picky eater – nothing healthy, meat and potatoes guy, and he went back three times. After he was all done I told him it was a really healthy dinner and he just smiled. HOORAY Sherri! I’m so happy to hear this recipe was a winner. Thank you so much for giving the recipe a try and taking the time to report back—I hope you find many more new favorite recipes too! This was so flipping good! My picky 6 year old even said she liked it..and that never happens. YAY!! Thank you Tiffany. I am so happy you all loved it so much! I found your recipe when I was searching for Mexican Crock Pot recipes on Google. I don’t buy quinoa, do you think I could use amaranth in its place? Thanks! Hi Kim, I have not tried amaranth in this recipe, so it’d be an experiment. If the liquid to grain ratio and time for cooking amaranth is similar to that of quinoa, I think you could give it a try. I’d love to know how it goes if you do decide to experiment. Hello! Making this for a potluck. Do you think it would keepp well on warm after cooked? We will be eating at different times. Thanks! Definitely Kelly! I hope you all look love it! It was a hit! First time I used quinoa. Much needed break from all the turkedy? Kelly, I’m so glad to hear the recipe is a winner! Thanks so much for giving it a try and reporting back! Looks like an awesome recipe. I don’t have a crock pot. Can this be made in oven or on stove top? Hi Kathy, yes, I think it could be made in the oven! I would recommend baking it, covered, at 350 degrees F until hot and bubbly. I haven’t tried this myself, so you’d be experimenting, but I imagine it would work! Oh my! this looks gorgeous and colorful! Cannot wait to try this. Do you have to stir this while cooking? Hi Sarah, no, after assembling the recipe, you don’t have to stir during the main cooking time, just in step 3 before adding the cheese. I hope you enjoy! Excellent recipe. Our entire family liked it! Thanks for posting it! I do wish I had counted out the servings to then quantify how much is each serving…eg. 1 cup? 2 cups? In this way, I could use the recipe for diet/portion control. Chip, I’m glad the recipe was a hit with your family! Thanks so much for taking the time to leave this wonderful review! Thanks so much, Danielle! I hope you enjoy the recipe if you do decide to give it a try! What is the serving size? Can’t wait to make It! Hi Jamie, I didn’t measure it cup for cup, but a serving size is calculated based on 1/8 of the recipe, since this yields a generous amount. I hope you enjoy it! Can you just throw the uncooked turkey into the crockpot as well, or does it need to be cooked separate?? Hi Brianna, the turkey needs to be cooked first, both for food safety and for flavor. I hope you enjoy the recipe! Thanks for this wonderful recipe. You just made eating healthy easy and delicious! I followed the recipe except for subbing the ground turkey with ground chicken. I made this on the slow cook option in my Instant Pot. It was packed with flavor! I served this up alongside fresh avacado. You’re welcome, Lisa! I’m so happy to hear you enjoyed the recipe—thanks so much for sharing this awesome review and rating! Made a pot this past Sunday and I have to say, this is one of the best Mexican dishes I’ve ever eaten. I have never left a review for food recipes before, but wow this is amazing…. Austin, I’m thrilled to hear it! Thanks so much for giving the recipe a try and for taking the time to share this awesome review! I can confirm it is amazing with ground beef. Can’t wait to take this to the next work pot-luck and impress everyone! Thanks for reporting back, Erin! I’m glad you enjoyed it! This recipe is delicious! I forgot to buy corn when I went to the store for ingredients, so I substituted a can of hominy that I had in the pantry and it turned out great. Amazing recipe that is now a staple in the dinner rotation! Emily, thank you so much for leaving this awesome review and sharing your tweak! I’m so happy to hear the recipe was a hit! Hooray Brandi! I’m so happy to hear you enjoyed this recipe. Thanks so much for taking the time to leave this awesome review! I ended up making this in a pot in the oven and only putting the bell peppers in just before serving. It turned out better than I ever hoped it would! Even the fiancé loved it! Thank you! Thank you for taking the time to leave this review, Ina! I’m happy to hear you enjoyed the recipe! I’ve made this in the crockpot a few times and love it! I’m now the proud owner of an Instant Pot and wondered if you’ve tried it yet? Hi Carolyn, I have not yet tried this in the Instant Pot. If you’d interested in experimenting, I’d suggest following online instant pot conversion guidelines for similar recipes. I’d love to hear how it goes if you do decide to try! Hi! Unfortunately, I didn’t measure each serving, so I’m not sure what the exact measurement is. I calculated 8 servings from the dish, so if you’re interested in knowing the exact portions, I’d eyeball one-eighth of the dish and measure that! I hope you enjoy the recipe! Made this last night for the first time, it was awesome! Randomly found it online and it was perfect. Thank you so much for the recipe!!!! Will definitely be making it again. Kelly, I’m so glad to hear this was a hit for you! Thank you so much for taking the time to give it a try and report back! I made this recipe for my family and everyone loved it! Even my toddlers! It’s so easy and delicious!! YAY Nancy! Thanks so much for giving this recipe a try and taking the time to report back. I absolutely never ever give feed back on my recipes that I try or purchases lol! However, this one was waaaaaaaay to perfect not to rave about! So thank you! FYI just found you on IG and I love how simple you make healthy food delicious! Nancy, I’m so glad that this recipe was worthy of a review! I truly appreciate your taking the time to leave a rating, and I’m so happy to hear you loved it! This recipe is really great, Erin! I’ve tried making a big batch of it and took some to my workplace. My co-workers love it! I also like the fact that even if I store some in the fridge for a month, the food still tasted as delicious as I had it first. Emily, I am so so happy to hear this! Thank you so much for taking time to leave this wonderful review too. It is so helpful and really means a lot! Hi! How would the amount of ingredients work in a 4 quart crock pot? Thanks! Hi Sabrina! I’ve never tested the recipe this way. I’d start by halving it and seeing how that goes. If it works well and you appear to have extra room, you can try increasing to 1.5 times the next time. Hi How much is a serving, 1 cup? Hi Heaven, unfortunately, I didn’t measure each serving, so I’m not sure what the exact measurement is. I calculated 8 servings from the dish, so if you’re interested in knowing the exact portions, I’d eyeball one-eighth of the dish and measure that! I hope you enjoy the recipe! Evelyn, YAY!!! I am so pleased to read this. Enjoy every bite! I made this for dinner about a month ago and was DELICIOUS! I am now making this again tonight, but I’m cooking it in a pot rather than crockpot. However while I was gone to the store my wife thought it was a chili so added stuff to it to make it taste like that. Hopefully she didn’t mess it up lol. But ah well c’est la vie. I’ve never reviewed a recipe before… But holy smokes this is good!!! Perfect for a meal when there are a thousand other things going on. Megan, I’m thrilled to hear you love the recipe! Thank you SO MUCH for taking the time to review! Great Recipe! Instead of chili powder and cumin I sprinkled in some fajita seasoning mix, just my own preference and it was delish ! Love how many servings it makes, definitely going to make this a weekly meal. That’s a great idea, Erin! Thanks so much for taking the time to make the casserole and report back! Wonderful! I made this for a church crockpot supper- there were 7 crockpots and this one was the only one that the entire pot was empty! It is easy to make and healthy! I’ve made it two times and making it several more times for company we have visiting this summer! Very refreshing and tasty! The empty dish at a potluck is always a great compliment, Carol! I’m so glad you enjoyed the recipe. Thank you so much for taking the time to report back! Tori, I am thrilled to hear this is one of your favorites. Thank you also for taking time to leave a glowing review. It means so much and is so helpful to others considering the recipe. Hey! By how much do you think I should decrease the liquid in this dish if I want to make it without the quinoa? I tried it the original way and it’s delicious but I was hoping to make it as more of a filling for tacos next time! Hi Allison! I am thrilled to hear you enjoyed this recipe and want to make it again :) I would suggest eliminating the water as a starting point – you could also try reducing some of the tomato juices from the fire roasted tomatoes or using 1/2 of the recommended enchilada sauce. Let me know how it turns out!! Hi Shannon! I don’t include sodium b/c I haven’t found an easy way to calculate it accurately. If you’d like to play around with it, you can use a free nutritional information calculator, such as myfitnesspal.com or Spark People. I just stumbled on this post but it does look great so I will try it soon. Not sure if anyone else commented on thi’s but when you mentioned the things loaded with protein and fiber you included turkey. No meats, poulty, or fish contain fiber. I’m sure you were more acknowledging the protein aspect of it in that part, but it’s important to distinguish that I think. Anyways, I am excited to try it! Thank you for sharing it. Joe, yes, I did mean that the dish is loaded with protein and fiber overall. I hope you enjoy it! I made this over the weekend and absolutely LOVED it! My husband said that it was the best meal I’ve ever cooked and wants it added to the rotation! I forgot to add the cheese and it was STILL amazing!! I served it with avocado, sour cream and some fresh pico de gallo! Carly, I am so so pleased to hear this, thank you! I am planning on cutting the recipe in half because I am only cooking for myself and my boyfriend. If I did this, would I also have to cut the cooking time in half? or does that not matter?? Holton, I’d suggest making it in a smaller crock pot if you can. I’ve never halved it, so I”m afraid I’m not positive on the cook time. I’d check it early, just to be safe! Delicious, easy and great for a group. Thanks, Erin! SO happy to hear it Eileen, thank you!! Could this be made with ground beef and brown rice instead? Megan, definitely ground beef! I actually cannot recommend the rice though, as it will alter the cooking time and liquid ratios. I just brought this dish (vegetarian version) to a potluck and got a lot of compliments. Several people even asked for the recipe. Delicious! Thank you. YAY Mandy!! I am so pleased to hear it. Thanks for sharing! Hi! This looks delicious. Can you please provide cooking time for an Instant appt? I found this recipe by way of your Instant Pot Black Beans recipe. Thanks! Benna, I have an Instant Pot version right here: https://www.wellplated.com/instant-pot-mexican-casserole/. I hope you enjoy it! I’m making this casserole over the weekend, if I have a 4.5 quart crock pot do I need to reduce the recipe at all? Brander, I would just to be safe. Try cutting it down by about 3/4. The cooking time should be similar. I hope you love it! I’m making this tomorrow but need to turn the crockpot on around 9am and we won’t be eating until about 5:30pm. Should I just set for low for five hours then have it on warm for the rest of the time so it’s not cooking and just staying warm? Will it negatively affect the meal if I do that? Kristin, I’d suggest having it cook, then turn off. Then, you can rewarm your servings. That way, it won’t overcook the quinoa. I hope you all love the recipe! We are very-busy-20-somethings who consistently meal prep for the week. Your recipe is a STAPLE of our diets. The bowls are highly preferable to spending $12+ for something local but 1/2 as tasty and not nearly as healthy. Sometimes we go meatless, sometimes we experiment with salsas and veggies, and this recipe is ALWAYS delicious. Thank you! I live in Australia and just came across this recipe and your blog! It’s amazing, thank you! Next time I make this I might add a touch less chilli powder, it had quite a kick to it! Kim, I’m glad you enjoyed the recipe! And welcome—I’m so happy you found my blog too! Love this food… I chose to use mild green enchilada sauce it tasted so good!! Karen, I’m so glad you enjoyed it! Thanks for taking the time to report back! I always need some help with variety at lunchtime!. Every recipe of yours I have tried has been so good! I am glad I came across your site… Mexican dishes are so yummy I never knew thanks for the amazing share. will visit your blog again. Delicious! I had to double it for my family. Added an extra can of tomatoes per the suggestion on one review. Family put it on their top Five! Woohoo! Thanks for taking the time to report back, AnnMarie! I made this today. It smelled wonderful all day, but I was very nervous about how it would turn out as it calls for NO added salt. Turns out, it didn’t need any! This was “absolutely delicious” according to my husband. Made with ground turkey, I offered sour cream, cheese, green onions, cilantro, avocado, a spicy guacamole, and organic Tostitos Scoops as a garnish. Only deviation I made and will vouch for in case anyone else is so inclined but doesn’t want to mess up, is I substituted 1 cup of barley for the couscous. When this recipe called for water I used chicken broth. In addition to the amount called for I used one additional cup of broth (in place of the water, so a TOTAL of 1.5 cups of broth to accommodate the need of the barley). It turned out excellent. Shannon, thanks so much for sharing your tweaks and this wonderful review! I’m glad to hear you enjoyed it. Have you ever froze this meal before cooking? I’m in a freezer meal mom group and didn’t know if this could work? Hi Lynze, I’m afraid I’ve never tried, but I do know that it freezes wonderfully after cooking! I have never bought Quinoa before and when I got home realized I had got quick cook grains. Can I still use it? Do I need to add it later it says cooks in 10 min? Hi Victoria, I can’t say for certain because I haven’t tried this recipe with quick cook grains, but since it’s a similar cooking time to quinoa it may work. You’d need to check how much liquid is needed for the grains and make an adjustment to the recipe if it uses a lot more or a lot less than quinoa. It’d be an experiment, but I’d love to hear how it goes if you give it a try. Hi, thank you for the recipe. It looks delicious! Have you ever made a version without beans? My husband is not a fan, so I am trying to figure something out. Thanks! Hi Christin, I have not made it without beans, but you could leave them out and increase any of the veggies that you prefer. I hope you enjoy it! I’m delighted with this recipe! It makes a delicious meal. I followed the recipe as written, but I made one mistake — I accidentally added 3.5 cups of homemade red enchilada sauce instead of 2.5 cups — but it didn’t seem to cause any problem. Also, I used a small 11 oz. can of “Fiesta Corn” with red and green peppers (drained) since I did not have fresh or frozen corn kernels — that substitution worked fine. Before I made this, I was not sure how so much liquid could be absorbed and result in a thick, casserole-like consistency. At the end of cooking, though, I found that this dish does not take long to thicken up after the cheese is stirred in and the crockpot is left to cook on high for 10 to 15 minutes, as directed in the recipe. I had lots of leftovers, which I packaged individually to take to work for lunches. This dish re-heats very well in a microwave. And it was a BIG hit with my Mexican spouse, which is a big “thumbs up” for you, Erin! This recipe is now in our regular rotation. Thank you for publishing it! NOTE: The weekend before I made this casserole, I made the homemade red enchilada sauce (following the link that’s included with this recipe) and refrigerated it in a jar. It was totally worth it! That delicious sauce really gives this dish just the right amount of spicy, smoky flavor — even though I accidentally added too much! Well done, Erin! Scott, I’m so glad the recipe was a hit. Thank you for taking the time to leave this review too! Could you make this in an instant pot?? I wasn’t a huge fan of the taste, but the consistency was good. It was fun to try! Hi Crystal, I’m sorry to hear the recipe wasn’t to your taste. I know it’s disappointing to try a new recipe and not love it, so I truly wish you would have enjoyed it! Made this today in anticipation of the chilly snowstorm coming . My husband said it was one of the best meals he’s eaten in a while! I forgot to put the enchilada sauce in the crockpot and if I had some tortillas on hand, I’d wrap up the casserole as an enchilada filling. We’re going to try that next time. Thanks for the great recipe! Dianna, I am so so happy to hear that! Thank you for sharing this wonderful feedback! Love this recipe!!! So easy. My daughter asks me to make it once a week. I’ve tried it with half ground beef half ground hot sausage, it was awesome too. I’m glad to hear the recipe is a hit, P.J.! Thanks for taking the time to leave this review! This recipe is absolutely outstanding!!! It’s easy, healthy, and extremely delicious! I meal prep this on Sundays and get a week’s worth of lunches out of this. My co-workers are always complimenting the smell when I warm this up in the break room. I’ve let 3 separate co-workers sample it before, and all 3 have asked for the recipe. They’re all hooked just like me! This will also be my go-to recipe for any potluck lunches in the future. This was a life-changing recipe, thank you Erin!!! Made this and it was great! It’s only me so I froze a bunch for leftovers! Thanks for the great recipe, trying to find healthier recipes and this one was awesome! Tyler, this comment makes my day! I am so so happy you enjoyed it. Thanks for taking time to leave this review! Ok, I followed the link here from your Instant Pot mexican casserole, and as I have enough gadgets, I’m not in the market for an Instant Pot. That said, I was down for trying out this recipe for quinoa! That is until one and a half hours into the cooking time I realized I never plugged in my crockpot!! I hastily threw it all into my large stock pot (because I doubled the recipe) and let it come up to a boil, then a medium simmer for 12 minutes. I expected the quinoa to get larger in size, it didn’t, but it was pleasantly chewy then. I served it ip, and *BLISS* It was delicious!! I’ll have to try it again in my crockpot, but apparently on the stovetop works well enough. It’s not mexican, but we loved the southwest flavors. This is now in our rotation! Thanks for a great recipe! Juli, I’m so glad you enjoyed this! Thank you so much for sharing this review. Made this today for dinner. It was very good and my house smelled wonderful. I made it with ground chicken but honestly, it doesn’t even need a meat. I’m glad you enjoyed this, Wanda! Thank you for leaving this wonderful review! Yum! Yum! Yum! This was wonderful. Loved that it is high protein, and soooo easy! Jeanne, I’m glad you enjoyed it! Thanks so much for taking the time to leave this review. Simply one of the best Mexican dishes I have ever tasted. The big bonus is that it’s healthy. I made a large portion for a family dinner and everyone loved it. I’m glad it was a hit, Della! Thanks for taking the time to report back! Hooray! I’m glad it was a winner, Claire. Thanks for taking the time to leave this wonderful review! Could you sub rice for the quinoa? If so, should I cook it first? Hi Katherine, I haven’t tried that swap myself, but a few commenters have done it with brown rice and minute rice if you’d like to check out their comments and results. Since rice has a different liquid ratio and cook time than quinoa, it’s not a straight swap. If you decide to experiment, I’d love to hear how it goes. We did a version of this tonight and and it was super! My kids really enjoyed it and there were no leftovers once my husband got a hold of it. I adjusted to what I had (or didn’t have in the cupboard. No onions and I personally can’t do kernel corn so we skipped those two. Wished we had fresh cilantro and avocado but that will be for next time. I also used Great Northern Beans (out of black) Definitely keeping this recipe. Great twist on chili, basically. Julie, thanks for sharing your tweaks! I’m glad to hear you enjoyed it! awesome! I followed the recipe exactly and will be doing so again, and again and again as this is now a family favorite. Thank you for posting this and now I am looking forward to trying some of your other recipes. Cheryl, this brings me so much joy! Thank you for sharing this review, and I hope you love the other recipes too! Hi Erin! Thanks for the very yummy recipe! In your nutrition section its says 1 of 8 servings, but not how big 1 servings is. Do you have that info? Also, did you know your recipes are in my fitness pal? Awesome!! Crystal, yes I add them to my fitness pal! I didn’t measure this cup for cup, so you’ll need to estimate it. I’d suggest dividing it all in half, then in half a few more times. That will give you an idea. So glad you loved the recipe! Hi – I’m going to make this but want to make it vegetarian, so how much more veggies or beans do I add to compensate for the meat? Hi Sharyl, you can add an extra can of beans in place of the meat! I hope you enjoy! LOVE this recipe!! Made it 2 times in 2 weeks! It makes a lot so it’s great for parties or wanting leftovers. I followed the recipe, but added a little bit of salt and a can of diced jalapenos. Delicious!! Rose, thank you for taking the time to review the recipe! I’m glad you enjoyed it! This is SO good. My family loved it for nachos, we also want to try it for stuffed peppers and lettuce wraps. I froze the leftovers and used them to make enchiladas a couple weeks later. Literally, restaurant quality. The best enchiladas I’ve ever made. Thank you for this recipe! Claudia, thank you for leaving this review! I’m so glad it was a hit! Any way to make this ‘less spicy’? Is it the Chilli powder? Looking for the great taste of this recipe but more kid friendly and I notice it packs alittle bit of a punch. Hi Kat! Other than making sure to use mild enchilada sauce, the chili powder is the only other ingredient with some spice. Different brands can vary with how spicy they are, so if yours is hot, you may want to dial it back. I loved this! I made it last night. Any way you can tell me how large a serving size is? My fiancé and I are trying to be a bit more accurate about our intake. Ryan, SO excited to hear you both loved it!! I didn’t measure the finished dish by cups, so I can’t give you an exact serving size. If you wanted an exact amount, you could measure out the whole thing prior to serving (or weigh it), divide it by the number of serving sizes listed in the nutrition facts (8), then portion from there. I hope that helps and enjoy the leftovers too! Hey there! I am at 5.5 hours and it’s still all liquid. Do I leave it for another 30mins…or an additional 1-2 hours for it to absorb the liquid? My crock pot is fairly big but this is my first time using it, I am not sure what size it is exactly. Any feedback would be great. I’m excited to taste it but I don’t want it soupy! Rayne, did you use the quinoa and liquid measures listed in the recipe? I’ve not heard of this much liquid being left in the crockpot for others! If your quinoa is cooked but there is still liquid, you can transfer it to the stove and try to cook more of it off that way. I hope that helps. I’m sorry I can’t be more specific, but it’s so hard to say what might have happened without being in the kitchen with you. I did, until I realized I thought it said 1 1/2 cup of water, instead of 1/2! AHHH! My first time using a slow cooker, and it just turned into soup. It was still really delicious, though! Haha. I will be making it again this week, and adding less water. Thank you for getting back to me! I’ll let you know how it goes for round 2! Rayne, I’m glad you were able to figure it out! I hope you love it next time too. Made this for a meal prep exchange and I was so delighted! when I separated it into the different containers, i’ll be honest that it didn’t LOOK that good but the taste was 100% there. Everyone had great things to say and I will be making this again! Addison, thanks for taking the time to share this review! I’m glad to hear you enjoyed it! Hi! I see that you put the nutrition information for each serving, which is great. However, I don’t see what the serving size is. Can you tell me the serving size? Azaria, I didn’t measure an exact amount for this after cooking it, so I can’t give you an exact weight or cup size. I’d suggest estimating by dividing the casserole into evenly sized portions of 6. I hope you love it!